Substrate should be solid, and ideally prepared to the original structural material. 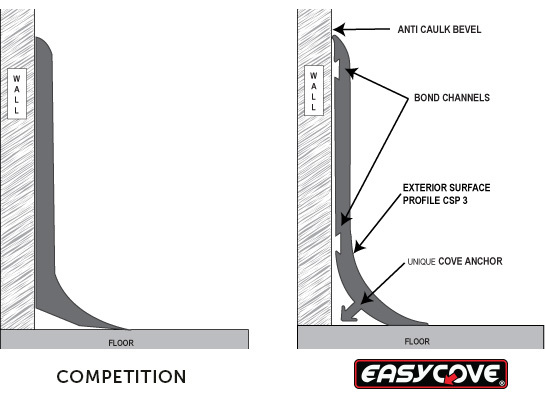 Whenever applying Easycove® coving over a previously painted surface, the bond will only be as good as the coating that Easycove® cove is adhered to. Easycove® coving should be applied at operating temperature of that room whenever possible. Once Easycove® cove is removed from the box, it should be stored in a warm area, completely flat. A hot air gun may be helpful to help the material relax. Once substrate is prepared, measure and cut the Easycove® coving to the desired length. Apply a 1/2 inch bead of the recommended adhesive to the floor/wall corner. NOTE: The purpose of the bead is to create a water-proof seal between the adhesive and the cove anchor. Failure to have a consistent half-inch bead may allow moisture to intrude and compromise the bond. Tilt Easycove® coving up into position and apply even pressure, using a soft cotton towel to make sure cove is completely pressed against the wall and floor. Using a clean cloth and isopropyl alcohol, wipe down the face to remove any dirt or contaminants and then apply epoxy in the same manner you would troweled cove using brush, roll or spray. Decorative flakes may be broadcast onto the cove creating a seamless cove to floor look.